Please join the City of Providence and the Rhode Island Public Transit Authority for an update on the Downtown Transit Connector (DTC) – a planned, high-frequency transit corridor in downtown Providence – and an opportunity to provide further input on the redesign of Kennedy Plaza. The meeting will be held on Tuesday, May 9, 2017, from 5:30 to 7:00 PM at the Joseph Doorley Municipal Building (first floor), 444 Westminster Street, Providence. 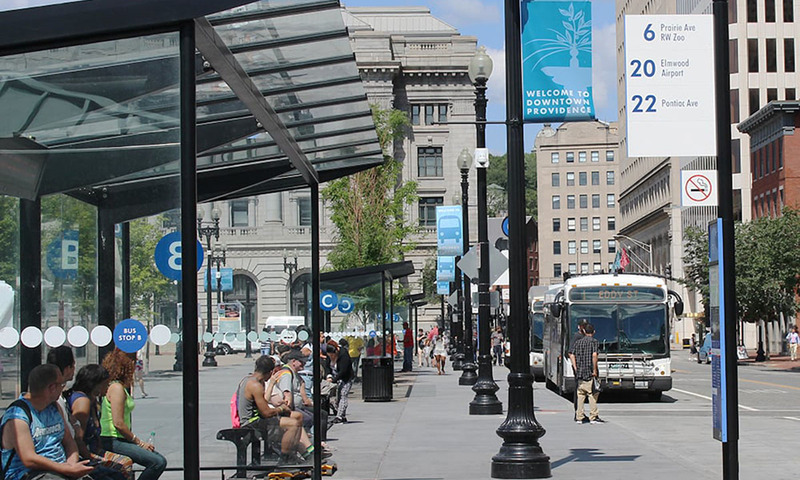 Both RIPTA and the City of Providence are seeking public input on the planned high-frequency DTC service and Kennedy Plaza, which will be a key stop. The City is in the process of looking at options for a long-term vision for Kennedy Plaza to make it a more active, vibrant, safe, and attractive city center while also accommodating public transit. In February, the City hosted a community meeting to gather public input on the redesign of the Plaza. During the upcoming May 9th meeting, the City will again engage community members in a discussion about the remaining options for the Plaza and surrounding area. At the same time that the City is exploring options for the Plaza, RIPTA is working to advance design and engineering of the DTC. The DTC will create six “station-like” stops on a high?frequency route between Providence Station and the Hospital District, and includes service through Kennedy Plaza. These stops will be designed to be unique and highly visible. Features will include shelters, real time bus arrival signage, bike infrastructure, and other passenger amenities to create attractive public spaces. Part of the design effort will include branding to create a specific identity for the new transit corridor. To create the new enhanced service corridor, RIPTA will extend about seven existing bus routes through the area to provide reliable transit service every 5 minutes between Providence Station and the Hospital District. Transit signal priority, a technology successfully used on RIPTA’s R-Line route, will be installed to extend green lights for buses and, in some locations dedicated bus lanes will allow buses to move more quickly in traffic. The DTC project is funded by RIPTA and a $13 million USDOT TIGER grant awarded to the City in 2015. RIDOT is providing funding for enhancements along the Exchange Street portion of the corridor to help create a more welcoming gateway from Providence Station to Kennedy Plaza. That portion of the project is also supported by federal funds. Additional funding will be sought to support identified Kennedy Plaza improvements.